Why is it such a problem today? To maintain cabin temperatures, these efﬁcient systems require a larger percentage of air to be recirculated. This creates an ideal habitat for mold, mildew, bacteria and other micro-organisms to grow. Spores from these micro-organisms are then regularly blown into the passenger cabin and colonize throughout the in-car environment. Older evaporators were made out of copper… Copper had a natural anti-microbial characteristic to it that helped prevent the growth of mold, mildew, bacteria and other micro-organisms. Every time the fan is turned on, harmful spores are blown into the air drivers and passengers breathe. 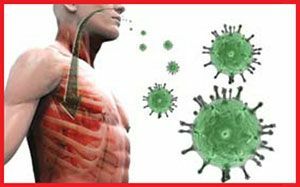 Major studies have conﬁrmed…this is a major health concern! The Aston researchers concluded that people typically spend three full years of their lives stuck behind the wheel of a car. In that time, they breathe more sickness causing germs in a car than they would ever ﬁnd at home on a toilet seat! 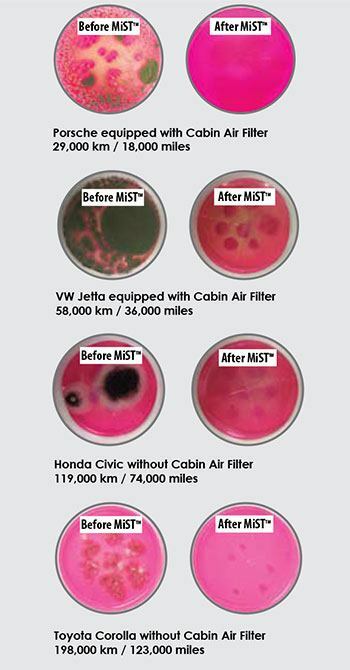 Below are actual samples that where taken from the vehicle’s HVAC system before and then two days after a MiST™ In-Car Air Quality service. The TerraClean® MiST™ System is highly effective in treating vehicles HVAC systems as well as cabin surfaces restoring in-car air quality! The TerraClean® In-Car Air Quality System features nano–droplet technology by MiST™ and is designed speciﬁcally for use with the MiST™ cleaning solution formula. In today’s automotive service landscape, vehicles are built better with longer service intervals. To remain proﬁtable, shops can’t rely on repairs, they have to build value through preventative maintenance (PM). In-car air quality is the perfect PM service because it targets the health of the driver not the vehicle. This PM service can be run on any vehicle, leased or owned that comes into your shop, regardless of year, make, model, mileage or condition. The TerraClean® MiST™ System embodies practical-minded innovation offering ease of operation and mobility. The service runs unattended by utilizing a durable and reliable machine that connects directly to the vehicle’s 12V DC. What makes this system so effective? Nano-droplets get to the source of the problem. They are drawn into the vehicle’s ventilation system and travel through the recirculation intake, penetrating and treating the entire ventilation system including the evaporator, heater core, air ducts and passenger cabin surfaces. Air freshnes only mask the underlying problem. Young children and pregnant women are the highest risk from the harmful micro-organisms. Spending a lot of time in their vehicle. Health effects from long-term exposure is well-documented. Spilled food/drink/garbage is a prime location for micro-organisms to grow. Hand Sanitizer or Wipes in a purse or car. Pets are carriers of micro-organisms and are also affected by the bacteria & germs. FACT:Mold is present in all vehicle's A/C system and interior surfaces. FACT:Mist has won awards from Popular Mechanics. PETEN(Profesional Tool & Equipment News) and Motor(magazine) Top 20 Tools For Effectiveness. FACT:Mist is a low cost solution that has high customer satisfaction rating.